Superior Donuts employs classic TV actors including Judd Hirsch and Katey Sagal with new comic Jermaine Fowler. The new CBS half-hour sitcom Superior Donuts has a special “sneak preview” premiere tonight (February 2) at 8:30PM ET/PT with a cushy time slot following a new installment of The Big Bang Theory. The series unites half-hour series TV veterans Judd Hirsch (Taxi) and Katey Sagal (Married… with Children) with popular and talented young comic Jermaine Fowler, and it is based on the play by Tony Award winning writer Tracy Letts. In Superior Donuts, Hirsch plays Arthur, the owner of a small donut shop that’s located in a quickly gentrifying Chicago neighborhood. Arthur is gruff and to the point and refuses to sell newfangled things like cronuts or macchiatos or renovate his dated shop that hasn’t changed since it opened in 1969. That situation changes when enterprising go-getter Franco (Jermaine Fowler) fast-talks his way into Arthur’s life as his new (and only) employee, and convinces him that he can bring the shop – and Arthur – into the 21st century. Speaking at the Television Critics Association press tour last month, the actors talked about what drew them to a project like this new series. “Any actor who’s probably done what I’ve done is probably looking for someone that wants to really, really write for him, because it’s the strength of the writing that eventually we become who we are, and you certainly hope that you become somebody that’s as memorable across the country as I could say some of them that I’ve had experience being,” Judd Hirsch said gratefully. “But I know that’s the key to success in this particular industry, and that it’s the people. It’s always the actors. And it’s always the writers writing for them that make the whole thing happen. You could be writing about anything. I’m kidding. You could take a show and take it a mile away from what it is and still will ring true,” he continued. 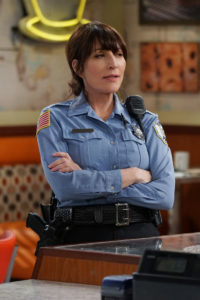 Katey Sagal found herself into the world of Superior Donuts because Hirsch told her she should do it. “We were doing Big Bang, and I was Penny’s mom and he was Johnny Galecki’s dad. And then, that day when I was doing it, they sent me the script to this and Judd said, ‘You should do this. You should do this. You should do this’,” she recalled. Was Sagal — whose more recent work has included serious and dramatic fare like Sons of Anarchy — ready to re-enter the sitcom world? “Oh, no. I was terrified. I wasn’t sure. I hadn’t done it for a while. And actually, I had a good experience on [The Big Bang Theory] and I remember calling my manager and saying, ‘I like this. This is fun.’ Because it’s all a rush of the live audience, which you do miss on single‑cam. And, you know, I wasn’t particularly looking to do this again, but this material drew me in and also them wanting me, which nobody ever realizes that somebody has to want to give you a job. They just think you can just choose the job, so them showing enthusiasm towards me [was nice]. And then, the material, I love that it’s timely, that it’s generational, that it’s really, really dimensional. There’s lots of different points of view. And to me, that’s what makes an interesting world, is that there’s all different pieces of it. And I also ‑‑ I love Jermaine and Mr. Hirsch, so I was honored to be asked to be with them. But to answer your question, yeah, it was pretty scary at first. It’s still a little scary. But I think a little scary’s okay. As an actor, you always want to be just a little bit terrified,” he admitted. Superior Donuts premieres at 8:30PM February 2 on CBS before moving to its regular Monday time slot on February 6.